The Carpenter Bee Control Kit provides a complete carpenter bee control solution for your home. The kit contains Delta Dust with a B&G Bulb Duster that allows you to dust in existing carpenter bee holes, and 20 x 3/8 inch plugs to stop up the holes. In addition, 3 x .4 oz bottles of Cyzmic CS Insecticide come with this kit. Cyzmic CS is a liquid concentrate that must be diluted with water and applied with a hand sprayer. Cyzmic CS is a unique insecticide concentrate with two active ingredients for quick initial kill and long-term residual effects. For the most efficient Carpenter Bee Treatment , you should first Inspect structures for damage and live bees. See our Carpenter Bee Identification guide to be sure that you are treating for the correct pest. You will need a sprayer such as a hand pump sprayer or Chapin Slide Pump Sprayer to apply the Cyzmic CS Insecticide. For Residents of CT, AK, NY, PR, RI, see our New York Carpenter Bee Control Kit. Outside on homes, decks, and wood surfaces that are exposed to carpenter bees. The Carpenter Bee Control Kit offers a complete solution for treating carpenter bees around your home. Both Cyzmic CS and Delta Dust start working immediately after application, but they also offer residual protection from new bees entering the area. Using Trebor Plugs to seal up existing holes after you have used your insecticides also helps to Prevent carpenter bee damage in subsequent years. Be sure to Inspect wooden structures thoroughly for carpenter bee nests and bee activity before applying insecticides. Cyzmic CS contains two active ingredients to create a unique and long-lasting insecticide treatment in areas where carpenter bees are likely to be active. Cyzmic CS must be diluted with water only and applied with a sprayer such as a 1 gallon hand pump sprayer. *To dilute Cyzmic CS, first shake the concentrate well. Fill your sprayer tank with 1/3 - 1/2 of the desired volume of water, then add the desired amount of Cyzmic CS concentrate. Agitate the tank before you finish filling the sprayer with water, then agitate again before your application. *For initial treatment, use 1 x .4 oz dose per gallon of water. For follow up treatments, use 1 x .4 oz dose per gallon of water. *Spray again after 21 days as needed while carpenter bees are active. *Begin spraying areas where carpenter bees have been active the past Spring and/or Fall, spraying prior to new activity or as soon as activity is noticed. Spray wooden areas that are susceptible to carpenter bee infestations including eaves, siding, fascia boards, railings, posts, fencing, and landscape fixtures. You may want to start on areas that receive lots of direct sunlight, at the apex of rooflines, and in areas where there are overhangs. *Applying a spray band to areas where bees are likely to excavate new nests will help to prevent new damage. *To reduce the likelihood of stings, treat in the early morning or late evening when bees are less active. *Spray once a month as needed while carpenter bees are active. *Cyzmic CS is versatile, aiding in control of many common crawling and flying insects, both outdoors and inside. See the product label for complete instructions. *Store Cyzmic CS concentrate in a temperate area, out of direct sunlight, and out of reach of children or pets. *To treat areas up to 30 feet high, consider using a Chapin Slide Pump Sprayer to apply Cyzmic CS Insecticide. Delta Dust is a water-resistant insecticide dust with the powerful active ingredient Deltamethrin, suitable for most common crawling and flying insect pests. Using insecticide dust directly in existing carpenter bee nests gives you the best chances of getting rid of carpenter bees that are already in the area. The formulation of the dry, powdery dust is even more accessible to carpenter bees since the tiny hairs on their bodies will easily pick up the dust. The B&G Bulb Duster 1150 has a large capacity as well as a flexible extension tip that makes dusting fast and easy. *After your spray application has dried, you can apply the insecticide dust. *Using insecticide dust can be very messy, so be sure to wear gloves such as Nitrile Chemical Resistant Gloves. 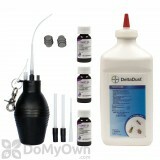 *To fill the Bulb Duster 1150, gently unscrew the top to allow space for filling the duster. *Gently unscrew the top of the Delta Dust, then tap dust into the bulb duster, filling the bulb no more than halfway to allow space for the dust to move inside the duster. *You may want to add a few small objects such as coins or pebbles to prevent dust from clumping. *Replace the cap by gently following the threads until the top is fastened securely. *Use the longest, curved extension tip for most applications. Additional segments may be added onto the top of the duster for more reach. *To apply dust, simply direct the extension tip into the application area, then squeeze the bulb to release the insecticide. *Before relaxing your grip on the duster, pull it away from the treatment area to prevent sucking up moisture or debris that may clog the duster or cause dust to clump. 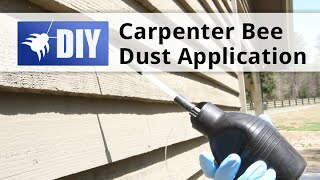 *Apply dust directly into existing carpenter bee damage. One puff of dust in each hole is plenty of dust for the bees to pick up a lethal amount of active ingredients. *Apply dust late in the evening to make sure you are contacting the existing female carpenter bees when they are less likely to sting. *Dust applications also help to eliminate the immature stage of the developing carpenter bee, reducing future populations. *Dust applications generally only need to be made once per season. *Store dust and duster in a dry, temperate area out of reach of children and pets. *Wait at least 14 days after spraying and dusting before sealing up existing holes. This allows time for the female bees to return to the nest, come into contact with the application, and spread the dust throughout the nest. *Plugging holes too quickly can result in bees creating new routes into the nest before coming into contact with the insecticides, resulting in more damage. *The included Trebor plugs fit perfectly into existing carpenter bee holes so that bees do not return to the same site the following year. *Holes also can be sealed with wood patch or similar materials. Here in Texas we have lots of carpenter bees and I purchased a log cabin that had been vacant and the bees made themselves at home. I ordered the kit and started filling in the holes, spray first then a plug and then I used caulking over the plug. The only downfall was I should have ordered extra plugs as I ran out. The bees seem to have found somewhere else to go as I haven't seen any evidence of them since using the kit. Thank you "DoMyOwnPestControl" I will be ordering more from you. I've seen the exterminator do this from time to time, and this kit is better than what they brought. Easy to fill and use. Highly recommend. Bees are gone after first application. Works very well. used powder, liquid spray and plugs as directed by internet instructions and haven't seen any carpenter bees or new damage in two weeks ( I keep my fingers crossed and my eyes open). If nothing happens the rest of this year or spring of next year I'll be a real happy customer. What can I use to treat carpenter bees that are eating my house where their holes are not accessible for a dusting application? They go up thru the vents on the soffits on the house. Their holes are not accessible for a dusting application. Would just using the liquid spray be effective? Any suggestions? Yes, a spray would be a good option for you since dust cannot be used. The Temprid SC inside of the Carpenter Bee Kit is a very good option. It has two active ingredients in it to help combat bees and other insects as well. There is a residual so it will keep on killing for up to 30 days. Does this Carpenter Bee Control Kit come with written instructions? I read a review that said no instructions were included. Each product in the Carpenter Bee Control Kit comes with complete instructions on the individual product labels but there is not written guide included. We do have instructions on the product page as well as a guide here that can help explain and can be printed. There are also videos to view. 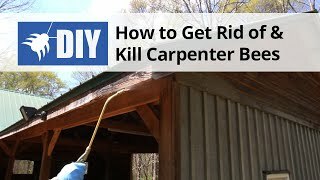 What is the best product to eradicate carpenter bees? I have a super colony of carpenter bees eating my house! What chemical will kill them and keep them away? We recommend applying the products from our Carpenter Bee Kit for the best results. For more information on treating carpenter bees, please click on the link below. 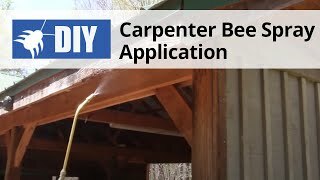 How much finished solution does the Carpenter Bee Control Kit yield? The Cyzmic CS insecticide in the Carpenter Bee Control Kit will yield anywhere from 3-6 gallons of mixed solution depending upon how you mix it. The label allows you to either mix half of the 0.4 oz bottle with a gallon of water or you may use the entire 0.4 oz bottle in a gallon of water. The Delta Dust (1lb bottle) covers 1,000 sq ft.